For three pivotal days in July 1863, Confederate troops under Robert E. Lee clashed with Union forces led by George G. Meade in and near the town of Gettysburg. When this iconic Civil War battle was over, more than 55,000 men were dead, injured or missing. The struggle left its indelible mark on the soul and imagination of the nation. The Peach Orchard, the Wheatfield, Devil’s Den and Little Round Top are some of the places where the Army of Northern Virginia waged its last major Eastern Theater offensive. These revered locations and valiant leaders, such as Buford, Chamberlain, Longstreet and Pickett, will take center stage during the 2-hour Gettysburg Battlefield Licensed Guided Bus Tour. You will ride in a climate-controlled motor coach while listening to a stirring narration presented by a National Park Service licensed guide. Guests will gain a unique and informed perspective on this heroic struggle. You will see the battle scars still visible on the rolling fields and rocky heights over which the men fought. The tour also includes many of the more than 1,400 monuments and markers dispersed across the landscape that was once awash in blood. The largest is the Pennsylvania Monument commemorating the service of more than 34,500 men from the Keystone State. The Virginia Monument, depicting Lee astride his beloved horse Traveller, is the largest Confederate and equestrian monument. Many memorials, monuments and markers indicate the location where specific units fought. You will also see the monument that commemorates the “high water mark of the Confederacy.” This was the farthest point that Confederate troops penetrated the Union line, which represented the South’s best opportunity to win the war. After this legendary fight, the Army of Northern Virginia never waged another campaign of this scope and scale. The tour also includes the Soldier’s National Cemetery, the hallowed ground consecrated by Lincoln’s immortal address. 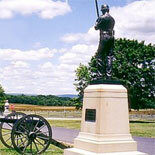 The Gettysburg Battlefield Licensed Guided Bus Tour is the most detailed excursion available of this historic fight. Be sure to include this tour when you visit the National Military Park.